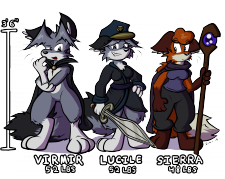 - If characters gain weight above their normal weights, listed here, they will round out and fatten up. - HOWEVER, if they go below their normal weight, they will begin to fill with HELIUM, and as they get closer to zero, gradually transform into inflatable pooltoys or balloons (I will mix it up if there is more than one). - Below 0 pounds, they will begin to puff up and inflate as they gain lift. You are totally capable of nullifying the spells of other people in a crazy battle to see which method of roundness wins on which characters. Extremely curious to see if people work together to obtain maximum effect, or if this turns into a crazy mess and by virtue of pure chaos, everyone ends up the same weight. So essentially you can vote many times if you follow me everywhere. I will tally up the TOTAL effect across all websites and draw the result next weekend! Edit: This is CLOSED now!